Calling all Arizona Health and Physical Education Teachers and Coaches!! 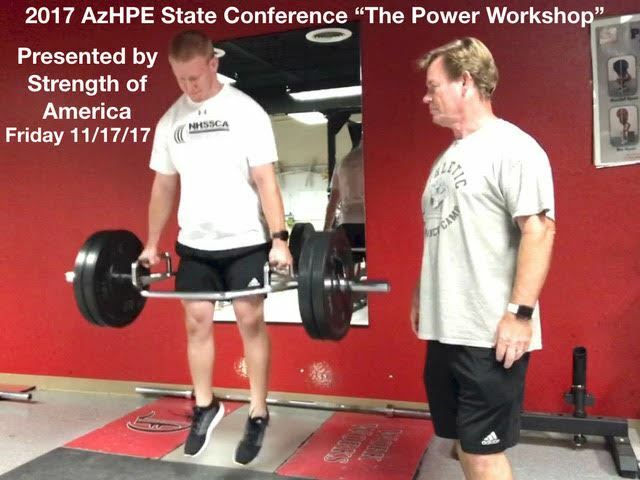 Don't miss this workshop at the 2017 Arizona Health and Physical Education State Conference. This is a hands on clinic where we will be breaking down the progression of the top lifts used in junior high and high schools in combination with body weight drills to Increase power, deceleration and Stability all components to help Vertical Jump, Broad Jump and Reaction! It doesn't matter if you have knee or back issues, you can see the progressions and know what needs to be done to Increase power not just lift the weight. Sign up early, please Like and Share this with other teachers and coaches in Arizona. Email questions or areas you want covered at this conference to strengthofamerica@gmail.com , Subject Line "The Power Workshop"
See you at the Convention! Be sure to watch our short video with overview of the workshop. Can’t wait to give your our BEST again this year!